So todays post is actually a collab. Today I am collaborating with the lovely Danni from soiectysentme. ( You can check out her blog here! ) Her writing style is really good and her photographs match her beautiful writing style. Make sure you check out Danni's post where she talked about school essentials and general organisation tips. 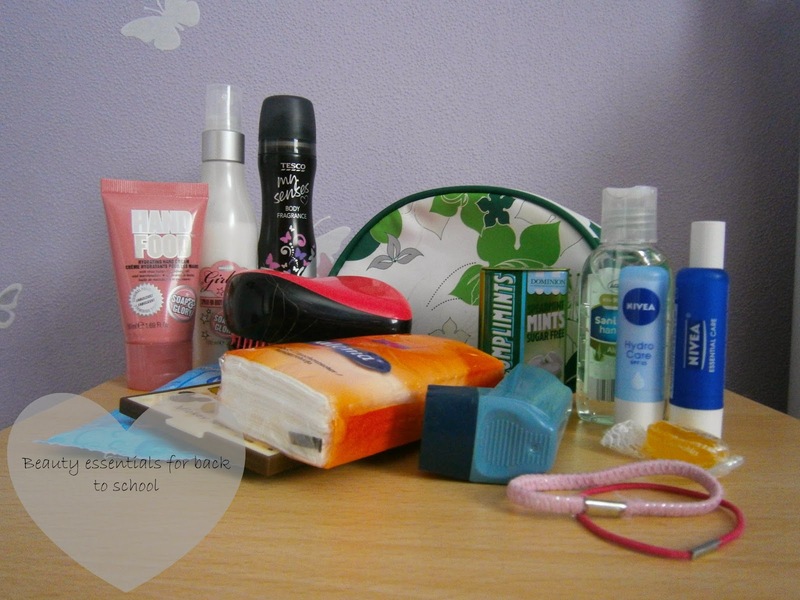 I will be talking about my beauty essentials for school! The actual bag is from a simple skin care set but you can get bags like this everywhere. Its my little tardis as it holds so much in it! 1. Hand sanitizer- This is an absolute must! I carry this in all my bags but its an essential for school as schools are pretty dirty places. 2. Body spray & deodorant- I carry my soap and glory spray with me to top up on throughout the day and also deodorant is a must if you do PE at school. 3. Hand cream- Not everyone will want to carry hand cream but its a must for me as my hands get so dry. It also makes your hands smell so good. This is just the soap and glory one. 4. Hair brush- I spend like 50% of my day outside so some sort of hairbrush is what I need to get those tangles out of my hair. I opt to use the tangle teezer compact. 5. Tissues and wept wipes- School isn't a very clean place so you will never know when you need a tissue or wept wipe to hand. 8. Hairbands- I always need hairbands for Pe and science. Take plenty because there will always be that girl who takes one and never gives it back. 9. Lip products and makeup - I don't take any makeup to school but I do take a handful of lip products as my lips get very chapped going to and from school. 10. Medience and tablets - Some people like to carry paracetamol with them, I don't because I never use it however I do need my inhaler as I have asthma.